The subway alignment recommended by Metror staff. Click above for larger image. Metro staff have issued their recommendations for a locally preferred alternative (LPA) route for the Westside Subway Extension. The project’s draft environmental impact statement/report was released last month. The full report is posted as part of the Metro Board of Directors’ agendas for its planning and Measure R committees. It will ultimately be up to the Board of Directors to select the LPA. They are scheduled to do so at their Oct. 28 meeting in downtown Los Angeles at Metro headquarters. •Staff selected the alignment that mostly follows Wilshire and ends at the VA Hospital in Westwood. The rationale: this alignment provided for higher ridership than alternative one, which would end at Westwood/UCLA, and would also push the subway west of the 405 freeway. The big issue here is funding: besides some other issues, Metro only has the funds at present to build the subway to Wilshire/UCLA or the VA Hospital. The other alternatives added a line from Hollywood to Beverly Hills through West Hollywood (see more below) and extended the subway from Westwood to Santa Monica. •They recommended not building a station at Wilshire/Crenshaw, which was deemed to be in an area of low density and too close (one-half mile) to the existing Wilshire/Western station. Elminating the station would also save the project $153 million. •A station spanning the Fairfax intersection (as opposed to completely on the west side of that intersection) was selected to provide for better access to LACMA. •A station east of La Cienega was selected because it is closer to commercial properties in that area and it was preferred by Beverly Hills. •Just west of that station, no connection structure is recommended to be built for a future West Hollywood line. 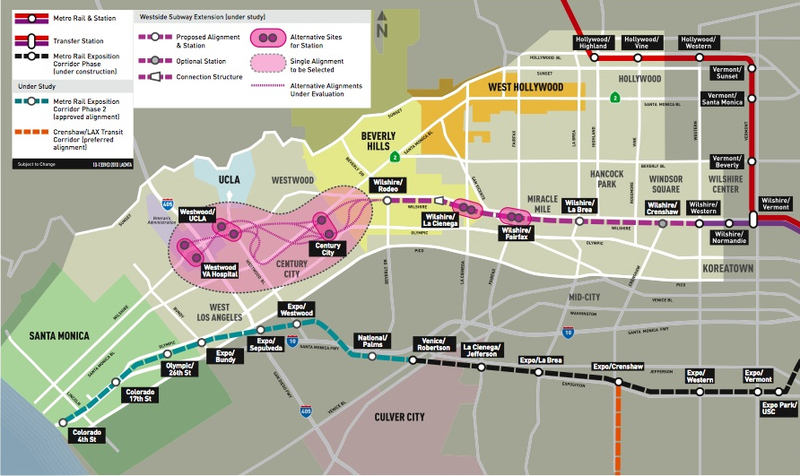 The rationale is that such a structure is expensive ($135 million) and it remains uncertain at this time if a subway will ever be built between Hollywood and Beverly Hills through West Hollywood, as was studied in the draft environmental report. Although the route performed well in terms of rail transit lines in L.A. County, it didn’t meet the very high federal target for heavy rail. Staff said Wilshire performed better and does meet the federal target and should be built first. There is no available funding in Metro’s long-range transportation plan for a West Hollywood line at this time. It was included in this study because the line performed well in the Westside Extension’s alternatives analysis, at which time Metro staff said they wanted to evaluate it further. •Both station locations in Century City — at Santa Monica & Avenue of the Stars and at Constellation & Avenue of the Stars — would continue to be evaluated in the final environmental study. The Constellation north alignment would be further studied, the Constellation south alignment would not. Staff noted that the Constellation station was preferred by the public outside Beverly Hills and the Santa Monica Blvd. station clearly the preference in Beverly Hills. The Constellation station would require tunneling under a few residential properties in Beverly Hills. An issue still being explored is the earthquake fault that runs roughly parallel to Santa Monica Blvd. •The tunnel would travel on the easternmost alignment studied between Century City and Westwood, which is also the shortest alignment. •Both stations at Westwood/UCLA would continue to be studied in the final environmental document. The two station location candidates are Wilshire and Westwood and under UCLA parking lot 36, which is just west of Wilshire/Westwood. *Both station locations at the VA Hospital would also be further studied — one is north of Wilshire by the Wadsworth theater, the other south near the hospital. It should be noted that although the staff recommendations are now published, public comments on the DEIS/R are being accepted through Oct. 18.Here’s the online comment form. The comments will be summarized for the Board of Directors, who make the final decision on what subway alignment advances to a final environmental study. Staff will respond to questions and comments as part of that final study. Why the urgency, you ask? Metro is seeking federal funds for the project beginning in the next fiscal year and getting that money means getting the draft study adopted by the Board of Directors as soon as possible. When will Metro explain how the VA station is going to work? I do not see how people are going to get to this station. It will sit on an existing parking lot, thereby removing parking spaces. There will be no new parking. Buses will not directly serve the station, unless they leave Wilshire and go through the little tunnel. And walking is not an option, because the station is way too far even from Federal Avenue. What is the VA’s position on the subway? How about the Army Reserve, to the west? How are the people of L.A. expected to comment on this station, with so many important details omitted? UCLA is a world class university which draws graduate students from all over the world. The economic benefit of a university like UCLA to the L.A. is not to be under estimated. Westwood is one of the few locations on the Westside where people can congregate and walk and its proximity to an important business center. This is the kind of location which Richard Florida would describe as a magnet for innovative people. The area east of Westwood contains a large number of condo structures which house large numbers of seniors. Moving the station further away from them will make the line far less accessible. Your article didn’t mention availability of parking at either location. Has Metro reached agreement with the VA or federal government regarding parking availability near the VA station. Placing such great emphasis on placing a station west of the 405 at the cost of the above factors is terribly disappointing. The VA Hospital station is not replacing a station at Westwood/UCLA. There will be a stop in the vicinity of Wilshire and Westwood and then another stop in the vicinity of the VA Hospital. The issue is where exactly the stations will be at both locations. Similarly, just building the subway to the VA west of 405 will get the ball rolling. And over the years additional funding can be found. Indeed, look at how already the subway has taken on a life of its own, considering the obstacles that were facing it. Until very recently people were saying “it would never be built in our lifetimes.” And now it’s getting into high gear. Plus, with all of these projects in the works and when the benefits actually kick in upon completion, I think you will see much greater public support for public transportation in LA. I agree with Joel C. about the VA station. This station could be such a great resource for Brentwood and West LA, but both the Draft EIR and the report to the Metro Board (released today) seem seriously to miss the mark in their analysis. The board report, for instance, evaluates the south vs. north option almost exclusively in terms of access to the VA Hospital…and completely ignores the enormous residential and business communities that are about half a mile away. It does not say a word, for instance, about the differences in possible forms of pedestrian access for the two options. This is incredible given how many people from the surrounding neighborhoods are likely to want to walk to the subway station. Can serving a single hospital building (however important) really be the sole criterion on which one should evaluate how to optimize the subway’s extension west of the 405? This does not seem logical.